Daily Slideshow: The Fat Boy is the preferred ride of homicidal movie cyborgs and everyday riders. The Fat Boy FLSTF was first released in 1990 as the limited edition 'Gray Ghost.' The monochromatic 'Fine Silver Metallic' livery with yellow detailing on the engine and bodywork was only available on the first few thousand production models. It is also widely believed that the paint scheme referenced WW2 bombers and their payloads — an urban legend the Motor Company has never confirmed. With its distinct solid cast wheels, the Fat Boy has been a Motor Company top seller for almost thirty years. 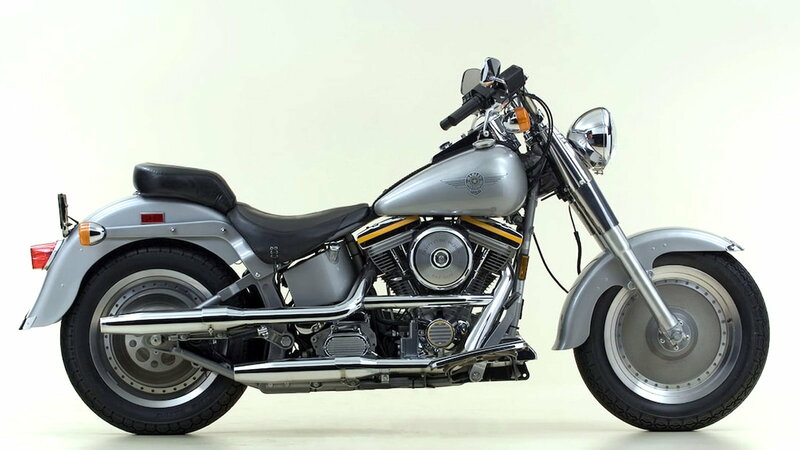 The Fat Boy design has remained more or less unchanged since 1990, with a few exceptions. 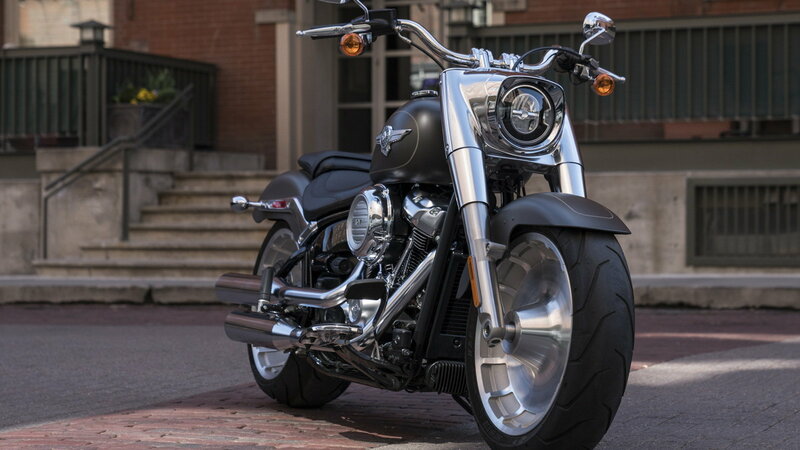 The Fat Boy Lo, released in 2010, was a “darker, lower, meaner” version and like most of Harley-Davidson's line-up, the Fat Boy was completely reworked for 2018. 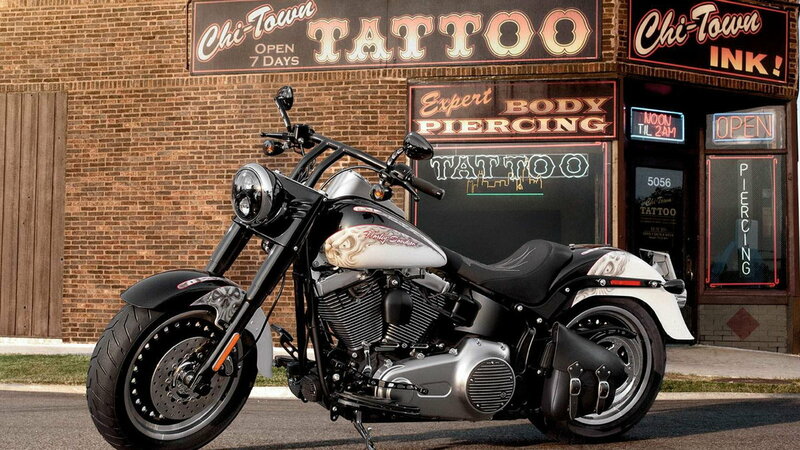 >>Join the conversation about the success of the Fat Boy right here in Harley-Davidson Forums. For 2005, Harley-Davidson commemorated the Fat Boy's journey with the 15th Anniversary Edition. The signature solid disc wheels were chromed, and the familiar tank emblem was gold-plated. The air cleaner, timing cover, and ignition switch also got a touch of gold. More importantly, the special edition featured a big bore, fuel-injected 95 cubic-inch Twin Cam — 88 cubic-inches was the largest displacement Twin Cam at the time. 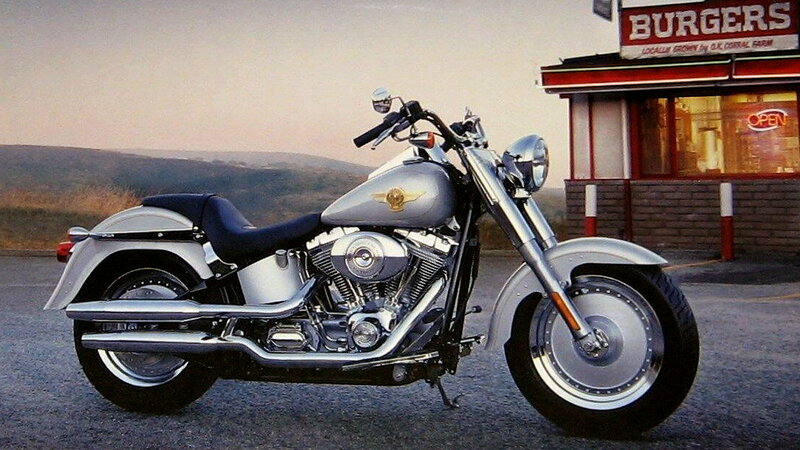 In 2005 and 2006, the Fat Boy was chosen for Harley-Davidson's Custom Vehicle Operations (CVO) program. 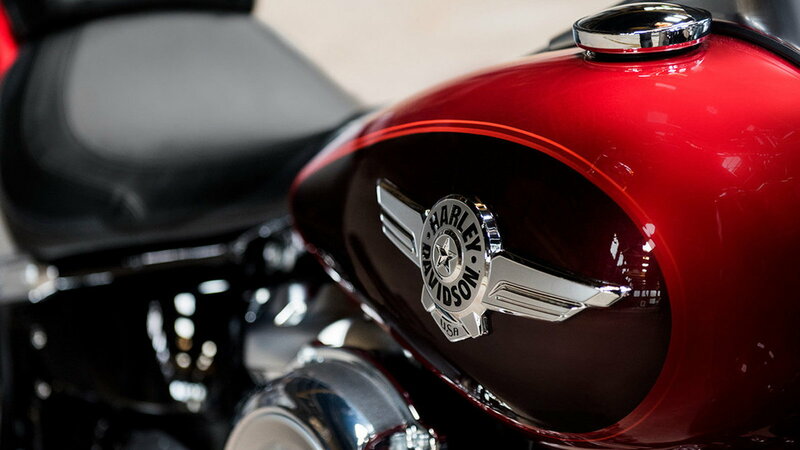 The 2005 Screamin' Eagle Fat Boy FLSTFSE featured turned-metal swirls on the gas tank in place of the winged emblem. 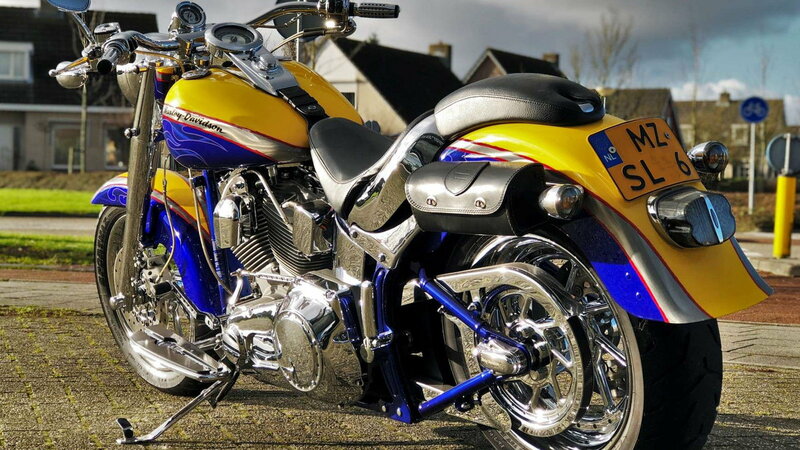 Both the 2005 CVO Fat Boy and the 2006 FLSTFSE2 received the 103 cubic-inch Twin Cam — six years before the counter-balanced 103 became standard in the Fat Boy line-up. 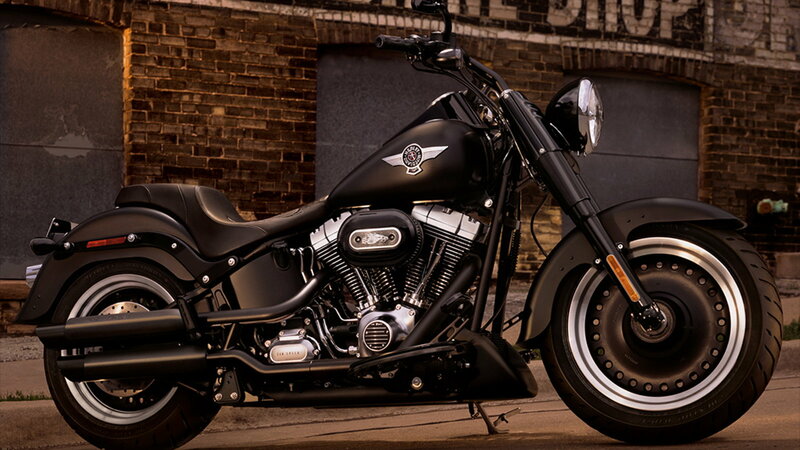 For Harley-Davidson's 110th birthday in 2013, the Anniversary Edition Fat Boy Lo was released. The special occasion Softail was painted in two-tone Vintage Bronze and Black and featured a 'single wing' tank emblem made from solid bronze, plated in black nickel, and then distressed to highlight the bronze. Other dress-up features included bronze highlights and trim inserts. Practical additions included a Security Package and an ABS braking system. Living up to its namesake, the redesigned 2018 Fat Boy FLFB is even beefier than before. The updated platform received the new, stiffer, Softail frame and the Milwaukee-Eight engine in either 107 or 114 cubic inches. Giving the Fat Boy its characteristic planted look is a set of hefty eighteen-inch machined aluminum rims with a 160/60 Michelin up front, and a massive 240mm wide Scorcher out back. 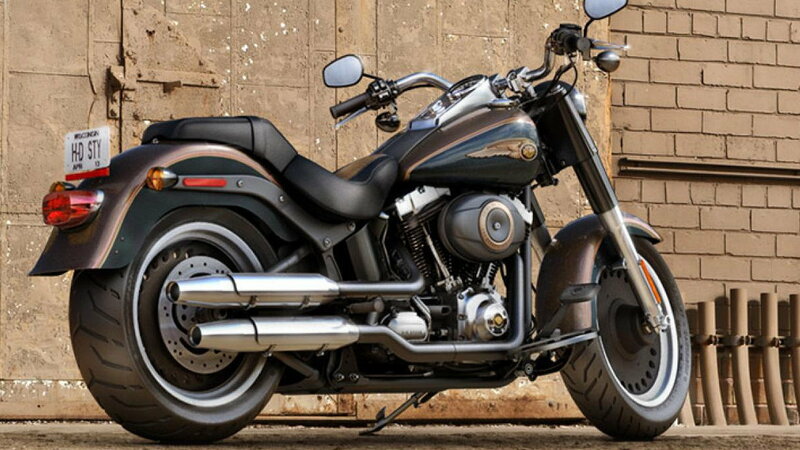 Harley-Davidson claims the 'Fat Boy' is all muscle — and this might be true. Endorsed by movie stars, the Fat Boy is famous for being the ride of choice for body-builder, turned actor, Arnold Schwarzenegger as the unstoppable T-800 cyborg in Terminator 2: Judgment Day. 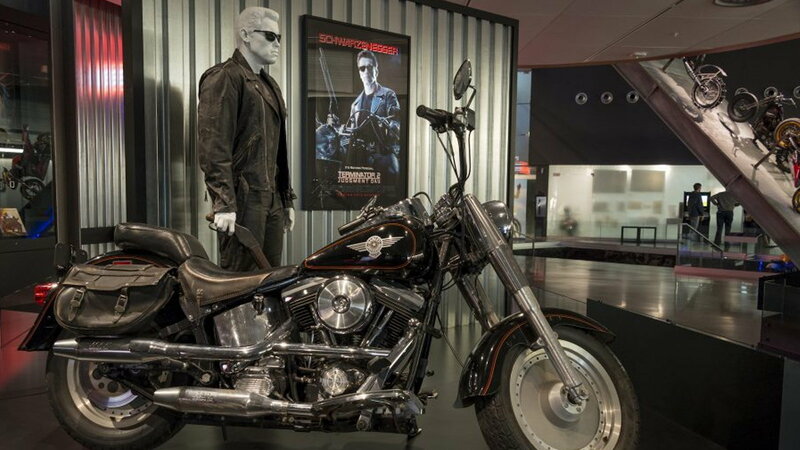 The Harley-Davidson Museum in Milwaukee, Wisconsin houses a permanent display dedicated to the Terminator and his 'stolen' Fat Boy. The original Fat Boy gas tank emblems were based on a scribbled drawing by Willie G. Davidson. Referencing air force insignia, the unique winged logo was meant to promote a sense of nostalgia and patriotism. The distinct emblems have appeared on every Fat Boy since 1990, except for select custom models. The popular icon has even found its way onto the new 2018 Fat Boy FLFB. Part of the Fat Boy's success was due in part to extensive testing and customer feedback. Before the 1990 release, Willie G. Davidson rode a prototype to Daytona Bike Week in 1988, and again in 1989. Since then the Fat Boy has become the pick of the litter for the Motor Company faithful. As a platform for customization, or as a long-haul highway cruiser, the Fat Boy has no problem gobbling up the miles.